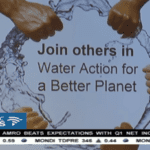 Will SA run out of water by 2030? South Africa could face a 17% water deficit by 2030 unless the country improves its water management. Trevor Balzer, Deputy Director General at the Department of Water and Sanitation talks about some of the interventions underway.